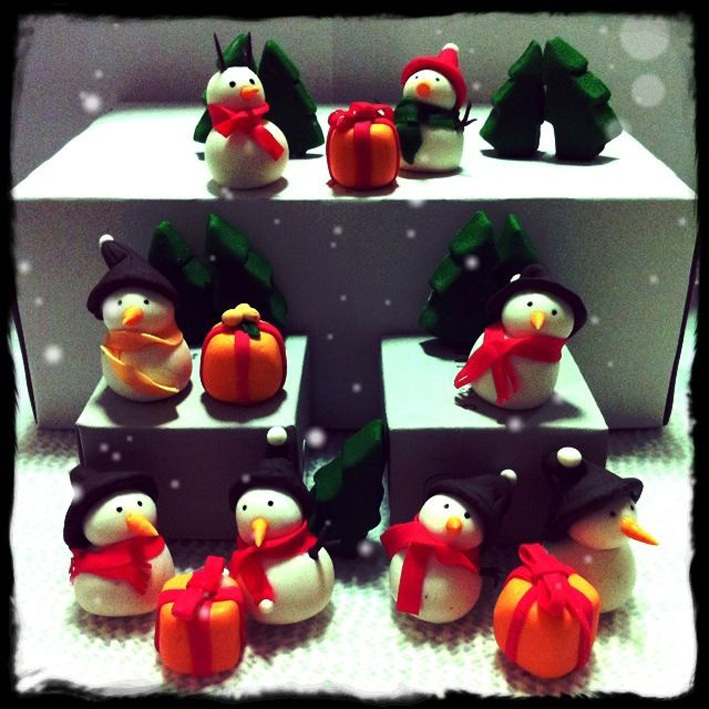 Festive season is here! Meaning me going insane again! The reason why I didn't blog for daysssss is because I was busy perfecting a gift. Edible gift. I have planned it for quite some time and all I need to do is experiment it, design it, taste test it, and perfect it! I am so so happy with the final product! I'm very happy because I have finally perfect the basic vanilla cupcake! Light and fluffy!! Top with light & not too sweet buttercream! Which is the most important part of the cupcake! 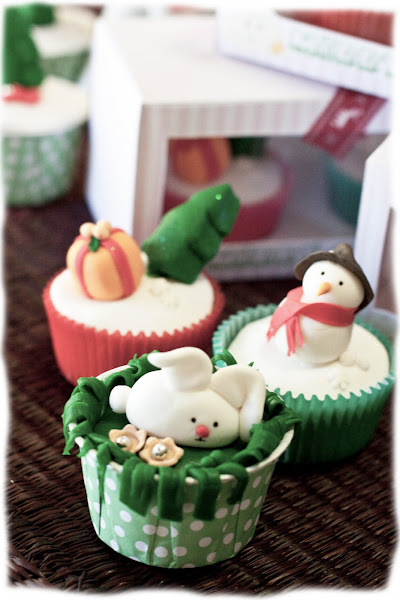 As I am giving these cupcakes to friends and family, I taste test these cupcakes like.. so many times! Just to find the flavour and texture that I'm looking for. 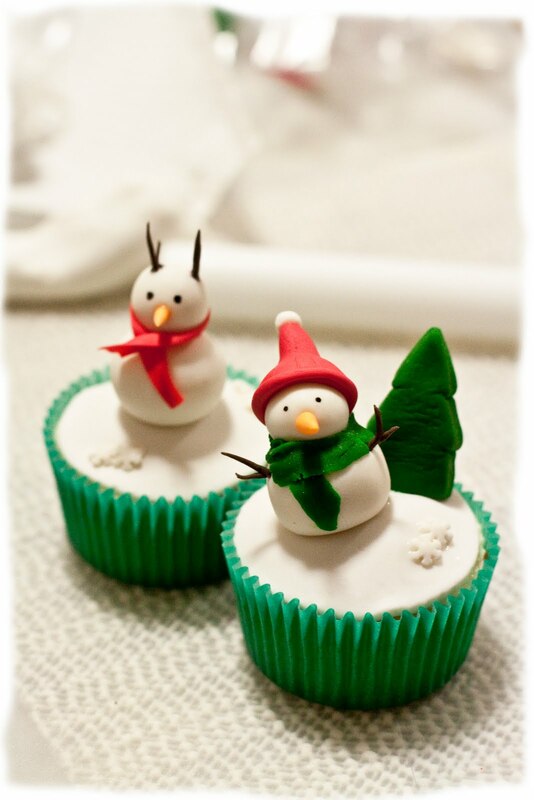 After I'm happy with the cupcakes, now it's time to make the Christmas toppers! My ideas just kept expanding while I'm kneading the fondant and kept making more toppers! I'm in love making the toppers! I had one of my friend to come around and do this with me, I think I have kinda tini tiny winny shocked her for a little bit after looking at a table full of stuff just to make the Christmas toppers. She is one talented girl too! 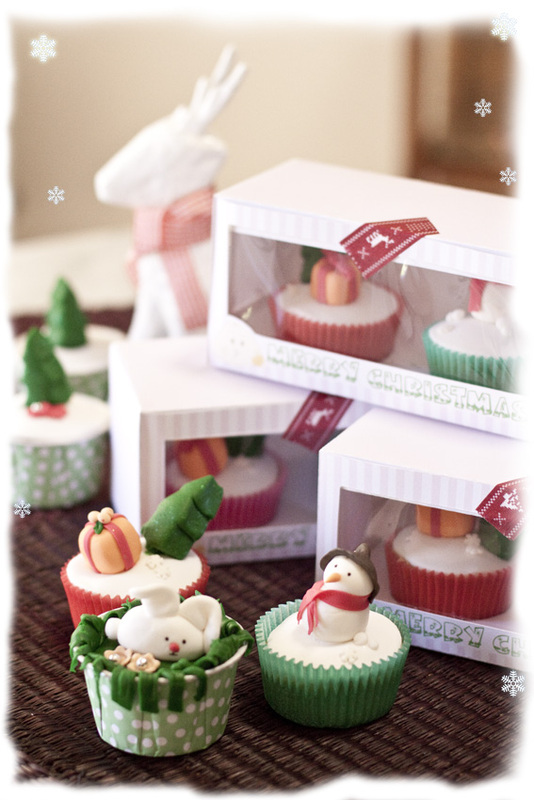 Learned really quickly and the most precious moment is when I saw her happy and excited face after making the toppers! Well, actually both of us have that happy and excited face together haha like a little girl saw their favourite toy! Now comes to transporting my cupcakes. I admit I am kinda fussy when it comes to packaging. I couldn't find a nice packaging that can hold 2 cupcakes in the shops. They either look plain or not my style. So yea.. 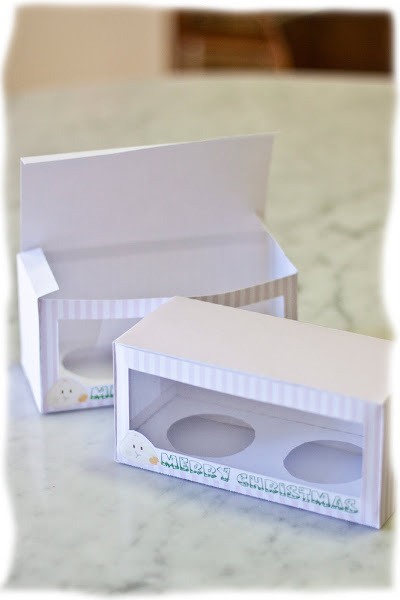 I made my first and very own cupcake box! From measuring, creating, designing, cutting and putting them together! I have given them all away as my christmas gift to my friends and family. Glad to see that they love it! 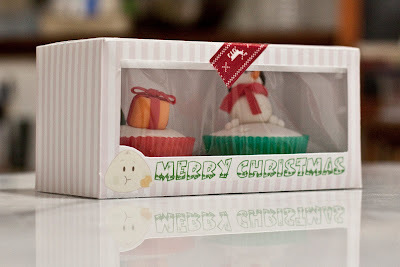 I was thinking... will any one of you would be interested to purchase the Christmas Cupcakes if I'm making them again for this coming Christmas (2011)? 7 days til Christmas! Maybe as a gift for your special someone? Please let me know if you are interested! 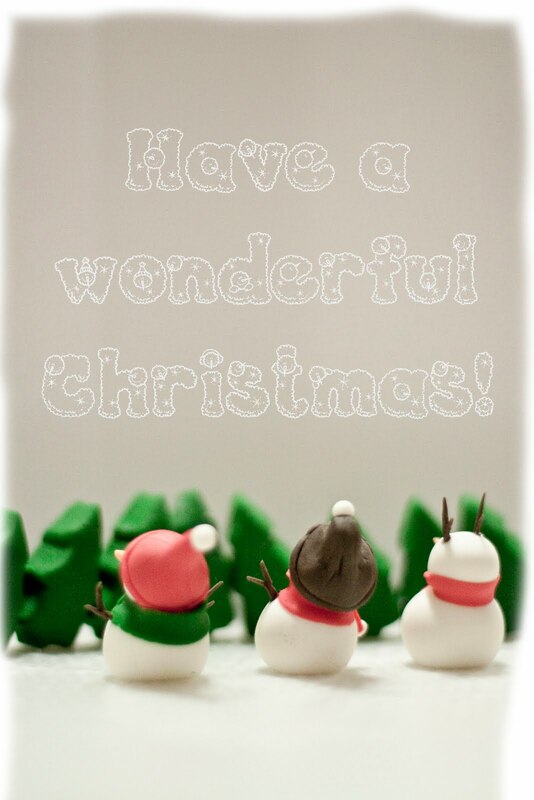 Anyway, little snowmans and me wishing you.. 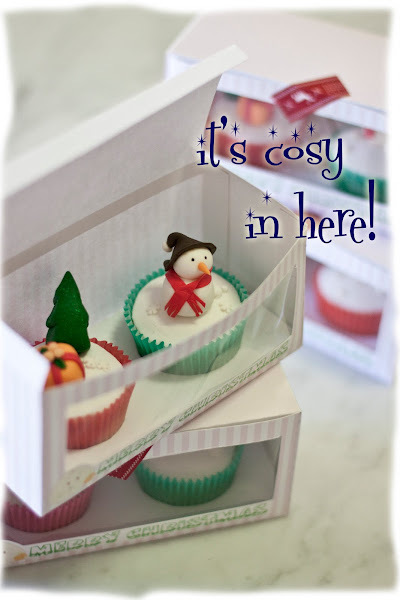 Sorry I had to closed off the ordering for the Christmas cupcakes due to huge demand. Stay tune for my next cupcake project! Thank you for the support everyone! Love you all!!!!!! I'm just sitting here stunned at how amazingly beautiful these are, they're incredible Jojo! And the box is sooo professional. It all looks so highly marketable, you need to go into business and sell these! Yes I would love to place orders for Christmas next year, let me know how much please! Yes would love to order this year! Can I have two? Can you email me the cost and details as to when they will be ready? PS I have a day off tmw so see you Tues.
oh wow!!!! what a great job, those are so gorgeous :) well worth the effort for sure! J Rabbit. What a cute group!